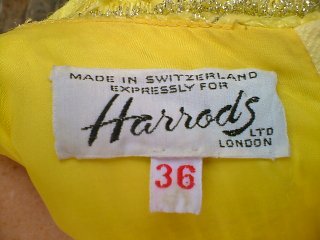 1960s yellow Harrods vintage dress with silver detail. 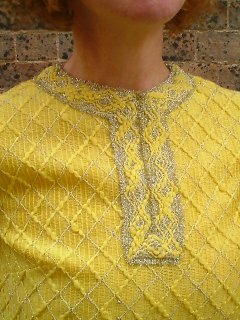 Psychologists have shown that, not only does is it make those around us feel more cheerful, but if you want to get your own way, you should wear yellow - so, what are you waiting for? 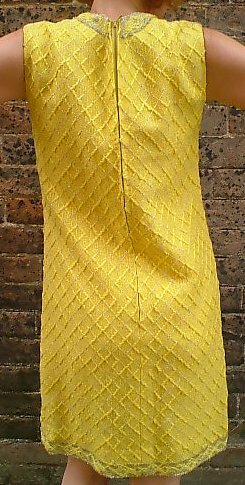 This unique, top quality, funky and flattering little dress will make your world a better place! I don't know what the fabric is, but it's soft, quite thick and loosely woven. It has a raised texture of diagonal squares, with their edges lightly silvered, and tinsel-like trimming at the hem and neck.